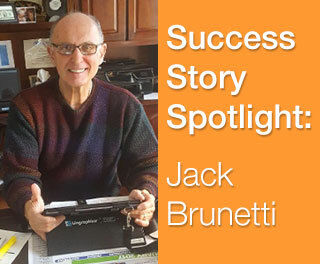 When primary progressive aphasia began to steal his words, Jack Burnetti found new hope in communicating with a device from Lingraphica. Read on for his journey to successful communication. grandchildren. 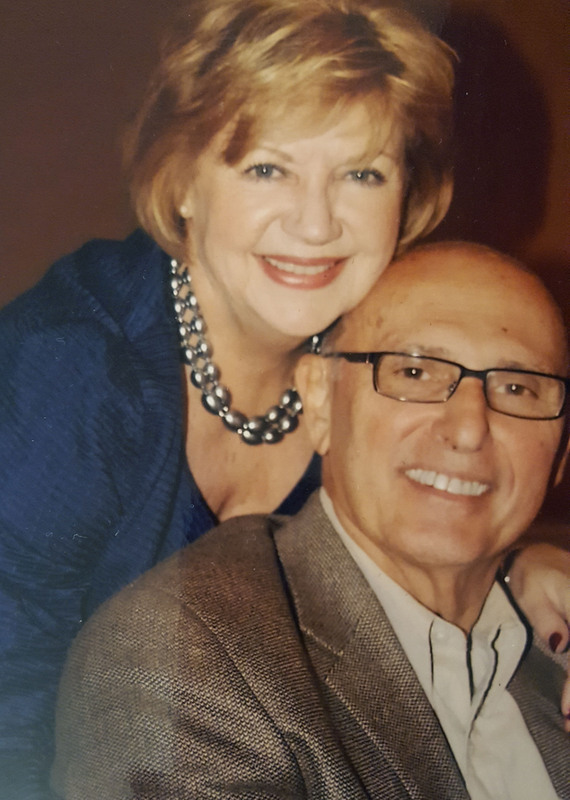 For many years, Jack's life was enriched by a love of Penn State football (Saturday home game ticket holders from the 1970s until 2007) as well as charitable work with UNICO, the largest Italian-American service organization in the world. He spoke fluent English and Italian for decades, until eight years ago when he began having language difficulties. Jack began mixing up his pronouns and dropping verbs from sentences. The Italian was disappearing from his vocabulary. He struggled to find words. As his language impairment progressed, his wife Diana took him to a doctor near their home in Scranton, PA. Jack underwent a battery of neurological tests, but doctors found nothing conclusive and said that he had a mini-stroke. Diana and their son, Steven, sat with this news for a while, but believed that something else was going on. "We knew that the initial diagnosis of a mini-stroke wasn't the answer. Something else was going on with Jack," said Diana. "So Steven decided to seek out a neurologist." Steven took Jack to Philadelphia to the University of Pennsylvania, and within 10 minutes, the skilled neurology department determined that Jack, who was 66 at the time, was not having difficulties due to a stroke. He had a neurological disease called primary progressive aphasia. Primary progressive aphasia, or PPA, is a form of cognitive impairment that involves a progressive loss of language function. PPA is caused by degeneration in the parts of the brain that are responsible for speech and language (the frontal and temporal lobes), and it usually affects people who are under age 65. It begins slowly and initially presents as difficulty thinking of common words while speaking or writing. PPA progressively worsens to the point where verbal communication by any means is difficult, as well as the ability to read or understand what others say. In the fall of 2016, Jack’s neurologist prescribed speech therapy, and it wasn’t long before Jack and Diana met with Debbie Belfanti, a speech-language pathologist working at Allied Services in Scranton. Belfanti was familiar with PPA and after evaluating Jack, started him on a free trial with a Lingraphica TouchTalk™ communication device. Jack loved the device and began using it to help him communicate. Since that time, Diana has been a strong advocate for Jack using his communication device. A few weeks ago, Diana made "cheat sheets" for the steps that are hard for him to remember, and she encourages him to use his TouchTalk often. Jack spends several hours at a time working on his device—creating words and phrases that speak on his behalf when touched. "These machines have so much potential," Diana said. "It's been a wonderful tool for Jack." Jack lost his ability to speak due to PPA. But with the help of his TouchTalk, he hasn’t let a lack of verbal communication slow him down. He goes to lunch outings with friends—some of whom have also had strokes, picks up groceries, and answers phone calls. Jack even used the device to say the prayer before the Thanksgiving meal. He also loves to read TalkPath News on his device. One morning in January 2017, Diana was working in the kitchen, and Jack was sitting at the kitchen table on his device when she heard, “I want to take a walk with Taser.” To Diana's surprise and complete joy, Jack independently constructed a complete sentence on his TouchTalk and used it to communicate about their dog, Taser. "It was a huge breakthrough. I almost couldn't believe what happened," Diana recalled. "Debbie (Jack's SLP) told me to be patient with him, and now, we're both so thrilled at his progress. It keeps him involved with the activities of daily living, and he's getting better with the device each day. He diligently strives to improve his communication skills and takes a lot of initiative with the TouchTalk after seeing how well it works for him. I cannot say how pleasantly surprised we are at how the Lingraphica TouchTalk actually expanded his ability to communicate with friends and family with such a great degree of satisfaction." 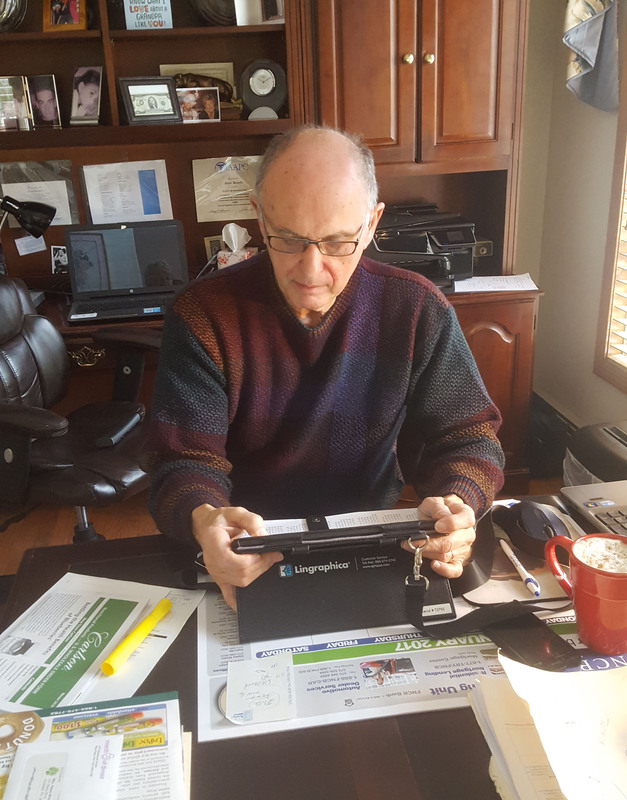 If you or someone you know has a medical need for a communication device like Jack, Lingraphica offers a free device trial to ensure a good fit! Click below to try a device!